The free-range African Plains section of the park opened in 1981. Visitors can get a clear view of endangered African savannah species, such as Chapman’s zebra and oryx, across water moats, not caged behind fences. Chapman’s zebra are currently at low risk status on the endangered species list, but like all other African megafauna they are at risk because of habitat destruction and illegal poaching. Two pairs of rare Scimitar-horned oryx were transferred to Orana Park in 1979. Oryx symbolise what the Park’s founders hoped for when it was formed. Oryx were declared extinct in the wild in 1984 but captive breeding programmes resulted in the species being re-established in protected areas. Orana was the first institution in the world to breed oryx by artificial insemination and over 80 oryx have been bred at the zoo. The park offers close encounters with some of its animals, including hand-feeding the giraffes, and a lion encounter where you can ride through the lion reserve in a truck-mounted cage during feeding time. Christchurch has an international quality zoo that is testament to the amazing foresight of the founders. Over its four decades of operation since 1976 Orana Park has had notable success in the conservation of both native and exotic endangered species. The park participates in 23 zoo-based breeding programmes, over the years it is African megafauna; cheetah, scimitar-horned oryx, white rhinoceros, Chapman’s zebra and Rothschild’s giraffe that have been its headline exotic successes. The challenge had a kick-start as the client was familiar with our native New Zealand flora and fauna and International Antarctica Centre wildlife art T-shirt design successes. So design pARTner Chrissie Terpstra and I were able to go ahead with the confidence and clarity that our proven design research and development process could proceed to originate a set of highly finished visuals of seven designs for client presentation and approval. 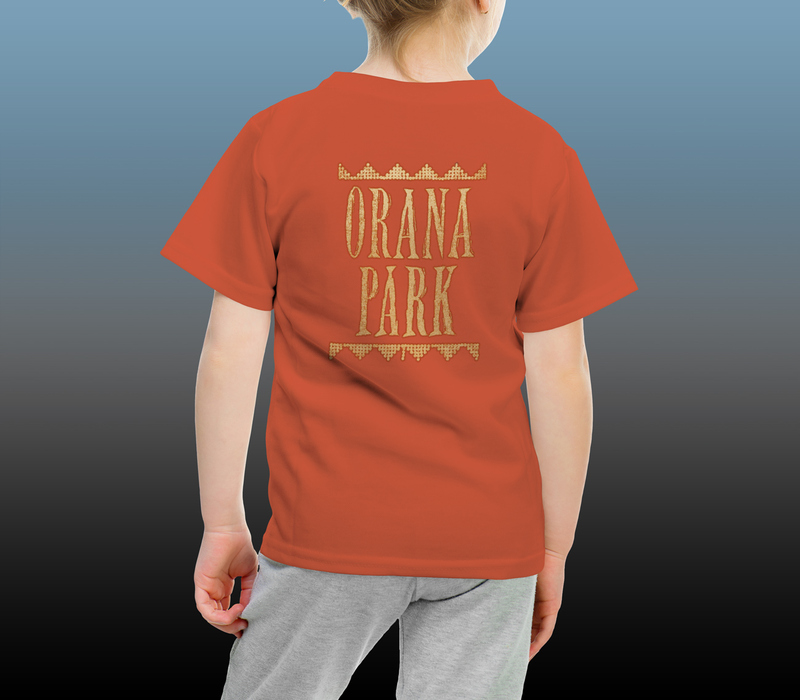 The shirt front lets the picture tell the story as a wildlife artwork, uncluttered with type, while the complementary print on the back of the shirt showcases the new Orana Park branding and tells the conservation story. The presentation visuals of the T-shirt designs I rendered with magic markers. What can be visualised can be developed into hand-separated three or four colour finished artwork. With visual design problem-solving is the tool for developing ideas for design themes. The Park made their image library available to us which opened up a variety of reference images to develop through the illustrative design process. Wit has a place in design. 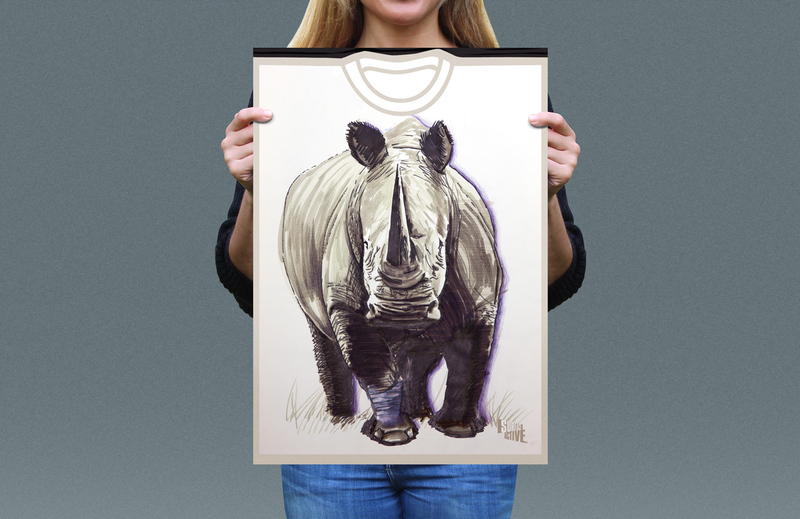 The big wildlife art idea for the white rhino T-shirt front suggested the playful idea for the back print. 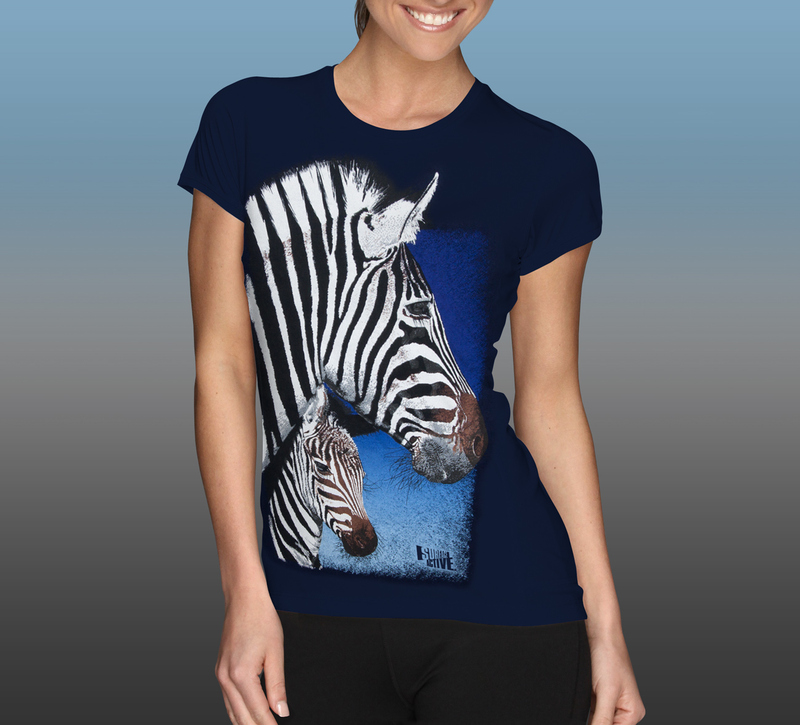 The shirt front lets the picture tell the story, while the complementary print on the back of the shirt showcases the new Orana Park branding and tells the conservation story with a brief outline of the Park’s role in the international captive breeding programme. There is a need for research within the area of T-shirt design development for a project of this scope. Orana Park has had tremendous exotic species conservation success in managed breeding programmes for the species they hold, they are also leaders in education and conservation advocacy. The use of highly rendered visualizations in our development process, in a structured way, for the five endangered species the client selected, is industry best practice—what we can visualise we can print as multi-colour hand-separated designs to inspire park visitors young and old. Design thinking, depth of knowledge, empathy, wit and intuition, these are all important paired with the use of thumbnail visualization to quickly develop rough concept sketches. This is the method for advancing design-led projects in the most efficient way. Cheetah, notoriously difficult to breed in captivity, arrived in 1988 and since that time Orana has been involved in the zoo-based breeding programme for these swift cats. Cheetah have become one of Orana’s flagship conservation species and over 24 cats have been raised to adulthood. Chief among the aims of Orana Park is to conserve endangered native and exotic wildlife and educate visitors, especially children, about environmental and conservation issues. 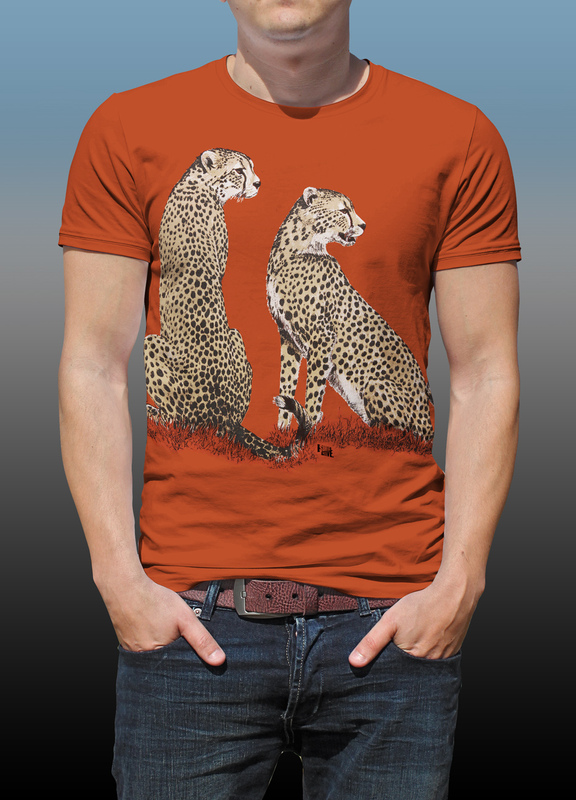 The cheetah, and Rothschild’s giraffe designs were developed into popular designs for kids. The scope and subjects for the set of designs of critically endangered species were given by the marketing and captive breeding programme managers. The single-minded purpose of the brief was to create a set of designs that are radically different from the generic run-of-the-mill otherwise available, with dark shirt printing on a set of fashionable earth toned coloured garments to accelerate sales. With the adult’s and children’s designs displayed together in store the effect was radically different and undeniably customised to the Orana Park wildlife experience. Once purchased by customers and supporters of the park these Surface Active T-shirts were worn with pride. 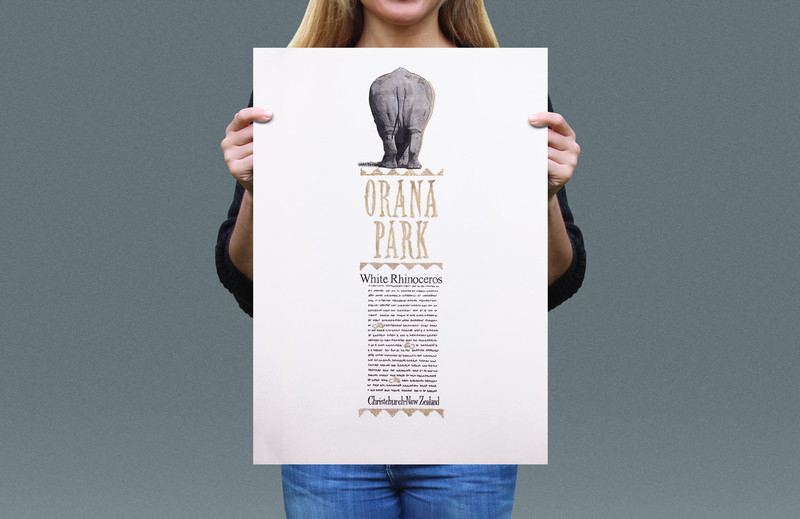 The new Orana Park logo developed for the endangered species T-shirt design range is printed in metallic gold. Design pARTner Chrissie Terpstra and I were tasked with the challenge of developing a strategy and new set of seven T-shirt designs for adults and two designs for kids, plus a fashionable new Orana Park brand to match—one that would reposition the Park as an inspired world-class facility of conservation solutions and actions to impact the future of wildlife, with a particular focus on African megafauna. The strategy we developed involved separating words and pictures, with a captivating upscale multicoloured print on the front, and a complementary Orana Park specific conservation story about each species on the back. 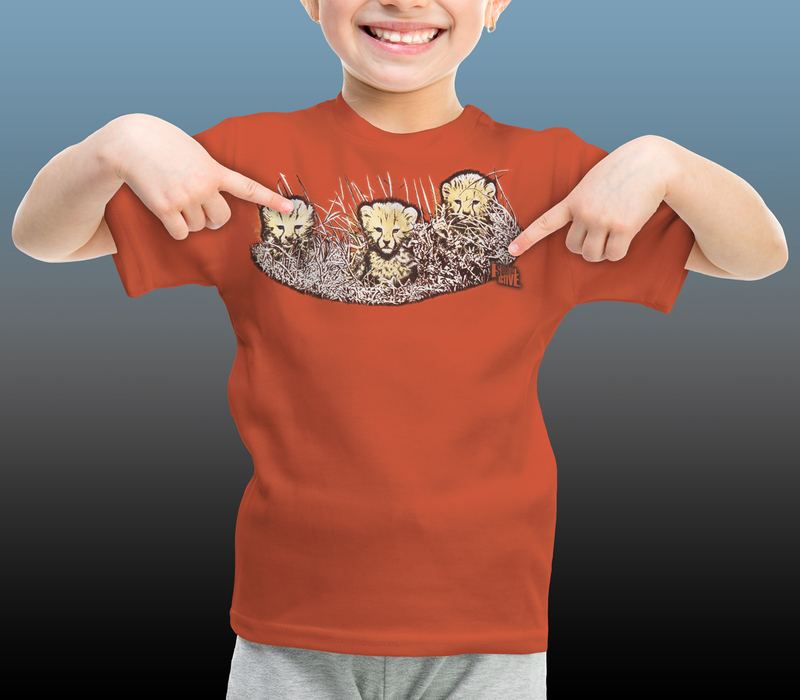 The endangered species wildlife art T-shirts inspire and educate about how the park works to engage with major conservation real-world issues affecting wildlife and stimulate active support for the important conservation and research relating to endangered animals that Orana Park is a world leader in. The single-minded purpose of the brief was to create a set of designs that are radically different from the generic run-of-the-mill otherwise available, with dark shirt printing onto a set of fashionable earth toned coloured garments to accelerate sales. Chrissie and I really wanted to push the boundaries with our designs to match this exciting new vision. To create a new park identity and set of wildlife art designs that would inspire the park’s staff, volunteers and visitors as much as the Orana Park staff inspired us, and a range of T-shirt designs that would increase sales in Orana’s Trading Post gift shop. Design, art direction, illustration, screenprinting: Design pARTners, Chrissie Terpstra and Shaun Waugh, Surface Active art-to-wear.